1) Provide documentation to the AMS Supervisor and Graders describing how carcasses over 30 months of age (MOA) are identified and segregated within the plant. AMS will review these procedures either during routine QSA audits or during supervisory visits. a. Plants with a Quality Systems Assessment (QSA) program (e.g., for Export Verification) will provide the applicable section from their quality manual which details this process. b. Plants without a QSA program will document their process through a Standard Operating Procedure or similar document. 2) Ensure the AMS Supervisor and Graders are aware of how carcasses over 30 MOA are identified/marked. The carcasses must be identified in a manner that allows the AMS Grader to easily see the identification when presented for grading. On Monday, Dec. 18, 2017, companies may only offer carcasses for initial quality and/or yield grading. No carcasses shall be presented for grading that were held as regrades from the previous week. These requirements are included in QAD 500 - Beef, Bullock, and Bull Grading Methods and Procedures. 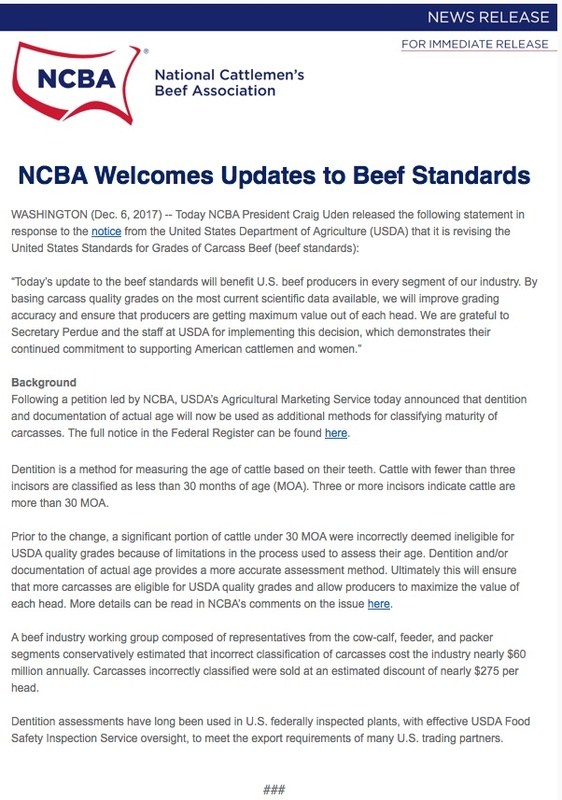 If you have questions, please contact Joel Gottlieb, National Meat Supervisor, at Joel.Gottlieb@ams.usda.gov (202) 253-1379 or Dana Stahl, Grading Branch Chief, at Dana.Stahl@ams.usda.gov or (202) 690-3169.